A growing number of New Yorkers over 50 are quietly but purposefully turning to entrepreneurship, boosting the city’s economy and helping scores of older New Yorkers become more financially secure. As the city's population ages, New York has a major opportunity to further expand encore entrepreneurship and support aspiring entrepreneurs who are starting later. Ask most New Yorkers to picture an entrepreneur, and they imagine a 20- or 30-something in jeans and sneakers. But the face of entrepreneurship across New York City is changing. Throughout the five boroughs, a growing number of older adults are quietly but purposefully turning to entrepreneurship for the first time. Spurred by recession-era layoffs, lowered barriers to entry, longer life spans, age discrimination in the workplace, and the need for financial security later in life, a diverse mix of New Yorkers over 50 are starting new businesses. This wave of “encore entrepreneurship” is still in its early days, but it is already showing signs of remarkable growth. 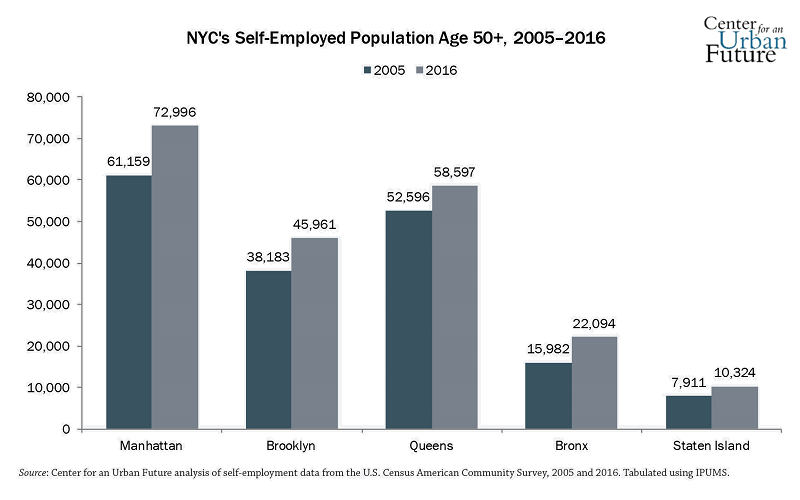 Citywide, there are now nearly 210,000 self-employed residents ages 50 and above, up 19 percent since 2005.1 There has been an even greater increase in entrepreneurial activity for those 60-plus, with the number of self-employed New Yorkers age 60 and above up 44 percent, to more than 104,000. Moreover, many of the chambers of commerce, small business assistance providers, and microfinance organizations that work with aspiring entrepreneurs report that New Yorkers over age 50 have gone from a sliver of their clients to one-quarter or more. The surge in encore entrepreneurship is already boosting the city’s economy and helping scores of older New Yorkers become more financially secure. But this could be just the beginning. Thanks to several emerging demographic, economic, and social trends—from the aging of the city’s population to the increase in the average life expectancy—New York will have an enormous opportunity to further expand the number of older entrepreneurs in the months and years ahead. For instance, New York City is home to 2.2 million New Yorkers between the ages of 50 and 74, nearly 26 percent of the city’s population. Older adults are also among the fastest-growing segments of the city’s population: The 50-plus population has grown more than 10 percent since 2010, and demographers project that nearly one in three New Yorkers will be over 50 by 2030. But realizing the full potential of older entrepreneurs will require a new level of planning and support from city policymakers. Indeed, though encore entrepreneurship is on the rise, the numbers of older New Yorkers who see entrepreneurship as a viable path are still relatively low. While several push and pull factors have made entrepreneurship more enticing for many New Yorkers in their 50s and 60s, the realities of transitioning to entrepreneurship are often daunting for adults who have spent decades working for someone else. Meanwhile, many older adults face unique obstacles when attempting to start a business in New York. New York has dozens of public, private, and nonprofit programs for supporting entrepreneurship, but hardly any initiatives have been targeted at older entrepreneurs. This is not unique to New York; there are few such programs in any American city. But New York policymakers and economic development officials would be wise to view the city’s aging population as an economic asset, and the rise of encore entrepreneurship as a vital opportunity. As this report makes clear, expanding the number of encore entrepreneurs would help many older adults become more financially self-sufficient while also spurring job growth and boosting the city’s economy. This study—the latest in more than two decades of research by the Center for an Urban Future focusing on opportunities to grow and diversify New York City’s economy—provides the first detailed look at the potential to expand the number of older entrepreneurs in New York City. Funded by Capital One, this report examines the rise of entrepreneurial activity among the city’s older generations and analyzes the promise of future growth. The study is informed by an extensive data analysis and interviews with more than 40 encore entrepreneurs located across all five boroughs, as well as dozens of business development consultants, nonprofit executives, community leaders, researchers, and other experts. The report defines entrepreneurship broadly, both as self-employment and business ownership, to capture the full picture of entrepreneurial activity among the city’s older population. It identifies the neighborhoods where boomer entrepreneurship is growing and analyzes the industries where these founders are establishing a presence, such as professional services and food-based businesses. The report also documents the challenges older first-time entrepreneurs face—many of them unique to their age group—and explores the potential to help more of their new businesses grow. Older adults are a significant and increasing share of the city’s entrepreneurs. Nationally, the share of new entrepreneurs between the ages of 55 and 64 increased more than for any other age range over the past two decades—from less than 15 percent in 1996 to more than 25 percent in 2016, according to the Ewing Marion Kauffman Foundation, a Kansas City–based foundation that supports entrepreneurship and has identified and analyzed entrepreneurship trends in the U.S. for two decades.2 The rate of new entrepreneurship among people ages 55 to 64 is higher than for people between the ages of 20 and 34, and Americans over 45 are now more likely to become first-time entrepreneurs than are those under 45. 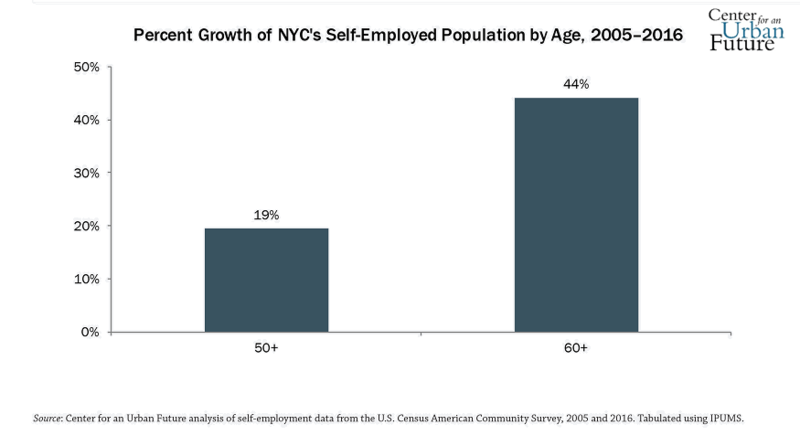 Our research reveals a similar spike in older entrepreneurship in New York City. Although there is limited city-level data available on the rates of small business formation broken down by age, our review of available data and interviews with leaders of organizations that support entrepreneurs makes it clear that New York City’s older generations are turning to entrepreneurship in record numbers. Our interviews with more than two dozen leaders at chambers of commerce, micro-enterprise organizations, local development corporations, and other small business development groups throughout the five boroughs provide further evidence that older entrepreneurs are on the rise. Our research found that as many as one-third of all entrepreneurs and aspiring business owners seeking help from these organizations are over 50, and most small business counselors say that interest from older adults is increasing. According to the Harlem Columbia Small Business Development Center, older entrepreneurs comprise 25 percent of the 400 clients they work with each year to develop new business ideas. At Brooklyn’s Business Outreach Center (BOC), which provides financing, advice, and technical assistance to microenterprises and small businesses, roughly 30 percent of its clients are encore entrepreneurs. At Grameen America, which provides microloans and technical assistance to low-income women entrepreneurs, 25 percent of its borrowers in New York City and nationwide are over the age of 50. Kiva, another microlender, reports that individuals over 50 account for 10.2 percent of all its borrowers in New York City versus 7.3 percent nationwide. Older entrepreneurs also comprise 15 percent of the food entrepreneurs working at Entrepreneur Space, a kitchen incubator operated by Queens Economic Development Corporation. In fact, our informal survey of food business incubators across the five boroughs finds that approximately one in six participants is at least 50 years old. The New York Women’s Chamber of Commerce based in Upper Manhattan reports that the number of women over 50 attending networking groups, seminars, and workshops for entrepreneurs has risen 10 to 15 percent in recent years. Likewise, the Harlem Business Alliance has seen a steady increase in the number of older adults in its programs, including in its Lillian Project, an incubator that helps black women develop and launch new businesses. The lure of entrepreneurship for boomers is also on display in the Brooklyn Public Library’s PowerUP! start-up competition, which each year awards $15,000 to first-time entrepreneurs. From 2011 to 2017, between 13 percent and 22 percent of entrants were at least 50 years old, up from 11 percent in 2003. Drawing from decades of experience, a wealth of connections, and some start-up capital, older entrepreneurs are also playing an increasing role as founders of high-growth start-ups. A Center for an Urban Future analysis of data collected by PitchBook, a company that tracks venture capital investments and transactions, reveals that the number of founders over 50 is on the rise. Between 1995 and 2006, just nine venture-backed companies in New York City were founded by entrepreneurs over 50—a rate of less than one per year. Between 2006 and 2016, there were 64 founders over 50, an average of nearly six per year. Older New Yorkers are turning to entrepreneurship both by choice and by necessity. Thousands of older New Yorkers are turning to entrepreneurship every month, for reasons as varied as their businesses. Some are drawn to entrepreneurship as the fulfilment of a lifelong dream, while many others are pushed toward self-sufficiency in the face of a daunting labor market for older workers or the inability to afford retirement. It’s the combination of these enticements and pressures that has been fueling the phenomenon in recent years—and it shows no signs of abating. The entrepreneurs we interviewed are striking out on their own as consultants, caterers, speech therapists, Uber drivers, and day care operators, attracted not only by the money they can make, but by the flexibility to set their own hours, be their own bosses, and offer services to a receptive and accessible marketplace. They include a work-from-home consultant in Manhattan who recruits college interns for Wall Street banks and real estate firms, a postal worker in Brooklyn who is turning her passion for cooking into a catering business, and a long-time employee of a Bronx motorbike repair shop who, upon his employer’s death, launched his own repair service—at the age of 55. At the same time, legions of older New Yorkers found themselves laid off or their roles scaled back in the wake of the Great Recession, and turned to entrepreneurship by necessity after facing long odds in the job market and age discrimination. Reentering the workforce after 50 poses serious challenges, according to labor market experts and older jobseekers themselves, especially for those with limited skills or education. Older workers are often more expensive in terms of both salary and healthcare costs, which creates an additional incentive for employers to hire younger candidates instead. In some cases, older adults report turning to entrepreneurship as a last resort, after struggling for months or years to regain full-time employment. 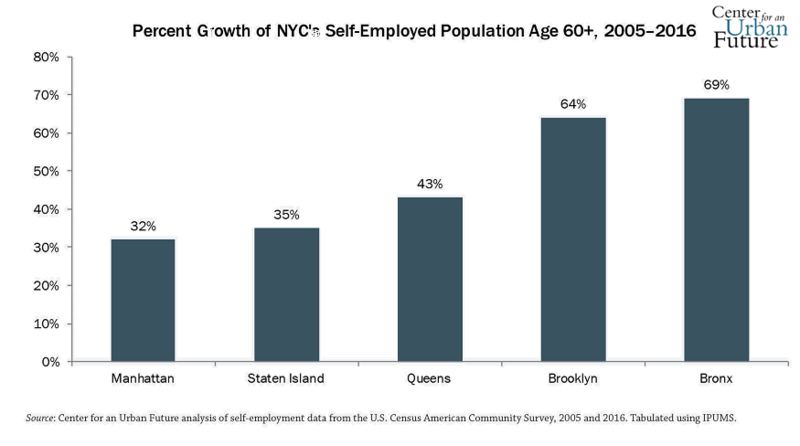 New York City’s demographics reflect the ideal conditions for a boom in encore entrepreneurship. 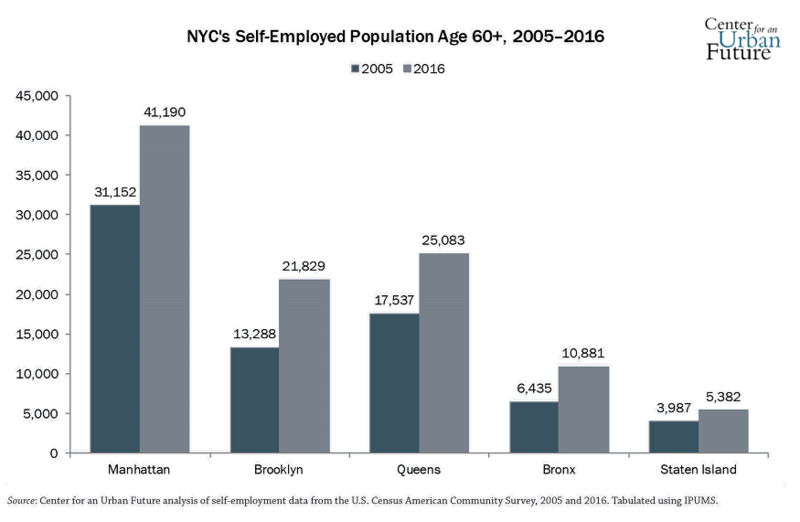 Although there are many reasons for the rise of encore entrepreneurship, one obvious factor is driving the growth: the aging of New York City’s population. As of 2016, there were an estimated 2.2 million New Yorkers between the ages of 50 and 74, nearly 26 percent of the city’s population. In the past five years, the senior population—individuals 65 and older— surpassed 1 million for the first time in the city’s history. Meanwhile, the 50-plus population has grown more than 10 percent since 2010. 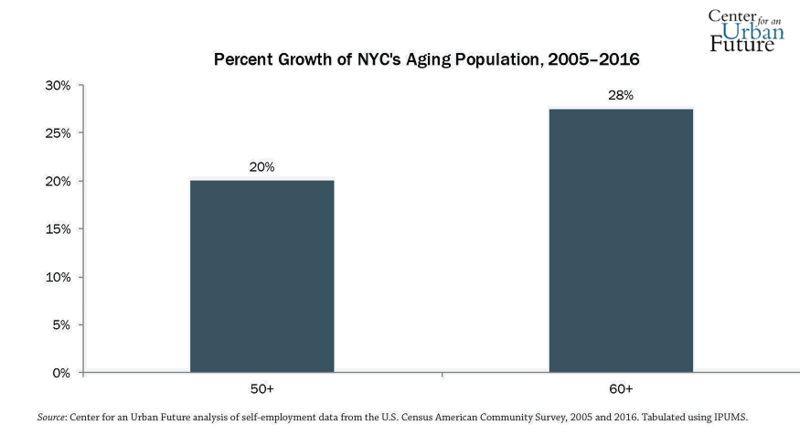 By 2035, New Yorkers ages 50 and older will constitute nearly a third of the population. And by 2040, the population ages 65 and older will have grown 22 percent since 2016, to 1.4 million. The aging of the baby-boom generation is the chief driver of the most recent increase in the number of older New Yorkers, and better health is playing an important role. Life expectancy increased citywide to 81.2 years in 2015, a jump of 1.5 years since 2006. In 2015, life expectancy nationwide was 78.7 years, a rate exceeded by 51 of New York City’s 59 community districts.8 The added years mean New Yorkers are enjoying a longer middle age, a period when they continue to be productive and creative —and eager to contribute to the financial stability of their families. 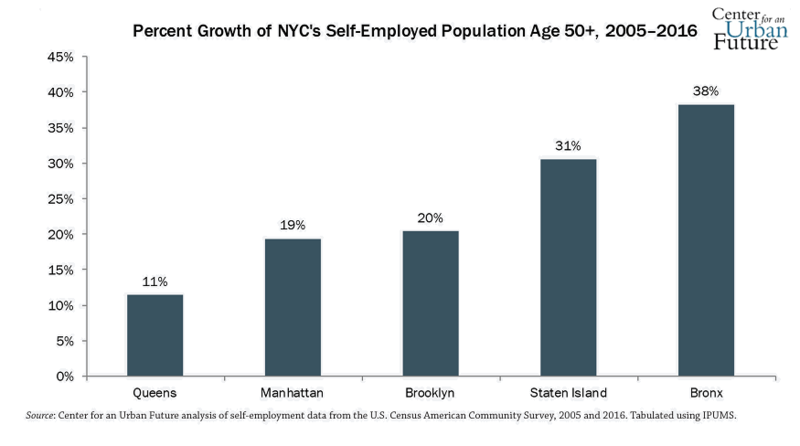 The increase in encore entrepreneurship is also boosted by New York City’s large and growing older immigrant population. Immigrants start businesses at twice the rate of native-born residents, driving growth in self-employment and new business formation in communities citywide. And today, a growing share of the city’s older adult population is foreign-born: last year, for the first time since the end of World War II, the share of older New Yorkers who were born outside of the U.S. reached 49.5 percent—nearly equal to the native-born share. Immigrants to New York will soon comprise the majority of the city’s older adults, as growth far outpaces that of the U.S.-born senior population: The number of native-born seniors grew just 6 percent from 2010 to 2015, while the number of immigrant seniors increased 21 percent. Ultimately, the aging of New York’s highly entrepreneurial immigrant population is likely to spur the growth of encore entrepreneurship in the decades ahead. Older entrepreneurs face unique challenges. Like all entrepreneurs in New York, older adults face obstacles as they try to start and grow businesses here—from the high cost of real estate to the challenges of accessing financing. But our research shows that aspiring encore entrepreneurs face several unique barriers, which sometimes make it hard for new enterprises to get off the ground and grow, and other times end up discouraging older New Yorkers from starting a business in the first place. When it comes to raising capital, all start-ups face struggles, as lenders are generally reluctant to provide capital to a business that has yet to prove itself. But for many older entrepreneurs, who are mostly starting smaller-scale, home-based businesses—not high growth start-ups—finding financial backing can be especially difficult. As a result, many older entrepreneurs report tapping their retirement accounts or other savings, with little time or opportunity to make up for a shortfall if the investment fails. Older first-time entrepreneurs also face challenges when it comes to taking advantage of new technology in managing and marketing a business. In a world where social media has become an essential marketing tool, unfamiliarity with platforms like Instagram is a major disadvantage. Many older entrepreneurs report spending time and money acquiring the tech fluency that many younger founders were seemingly born with. Although there are clear challenges facing older entrepreneurs, the biggest problem of all—or, rather, the biggest opportunity—is that relatively few of the older adults who could benefit from self-employment or entrepreneurship are currently pursuing this path. In New York, an opinion survey last year by the American Association of Retired Persons (AARP) found that 36 percent of its members in the state were interested in finding new ways to make money, including 15 percent who want to start a whole new career, and 12 percent who were itching to launch their own businesses.10 Yet, after spending all their adult lives working for someone else, many New Yorkers over 50 simply haven’t viewed entrepreneurship as a viable option. “Older New Yorkers don’t even know that this is an opportunity, that entrepreneurship is something they can do,” says Allison Nickerson, executive director of LiveOn NY, an organization that advocates for older New Yorkers. Countless others considered entrepreneurship, but ultimately lacked the confidence to take the plunge. “It’s the biggest obstacle, the lack of confidence that they can do it,” says Elizabeth Isele, co-founder and CEO of SeniorEntrepreneurshipWorks.org, and herself an older entrepreneur. One factor limiting the confidence of aspiring older entrepreneurs is a lack of visible role models. Exposed to few prominent examples of successful encore entrepreneurs, many New Yorkers over 50 question whether entrepreneurship is a path that’s open to them. 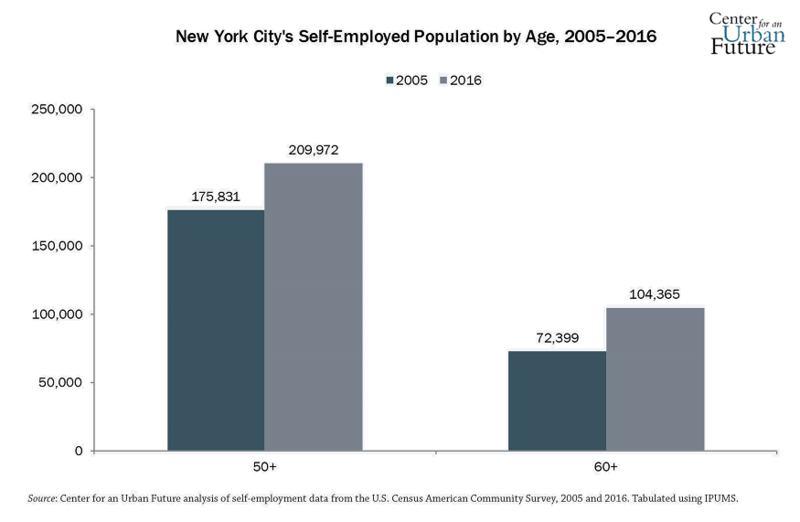 Unlocking the considerable potential for older entrepreneurship in New York will require new efforts that encourage older adults to consider self-employment, perhaps similar to “teaching entrepreneurship” programs that exist today in some city high schools. Although the city boasts an arguably unmatched network of public and nonprofit small business assistance programs that provide training, advice, and incubation spaces for aspiring entrepreneurs, many older adults never get to the point where they seek out technical assistance, apply for a loan, or attend a seminar on writing a business plan. Beyond new initiatives to promote entrepreneurship, New York could also benefit from a more robust support system for older adults who are considering entrepreneurship or self-employment. Few of the existing small business assistance programs actively target or recruit older clients, and most have never built relationships with the organizations that work mostly closely with older New Yorkers—from advocacy organizations like AARP to senior centers. “It’s a population that has never been included when we talk about entrepreneurship,” says Quenia Abreu, executive director of the Women’s Chamber of Commerce. At the same time, senior centers, churches, and other places in the city where older adults gather tend to focus on issues such as health, recreational activities, and achieving financial security in an effort to ensure older New Yorkers a safe, comfortable old age. If they deal at all with work-related issues, it is to help participants find a job, not start a business. As a result, many if not most older New Yorkers lack any reason to believe that they could be entrepreneurs and rarely come in contact with those who have taken the leap and succeeded. To be sure, the de Blasio administration has rolled out several promising programs to help small businesses and support a diverse mix of entrepreneurs, including new initiatives for supporting women entrepreneurs, immigrant entrepreneurs, and low-income entrepreneurs. But given the graying of the city’s population, the fact that New Yorkers are living longer, and the increasing need for older New Yorkers to develop new income streams, it’s time for the administration’s economic development leaders to develop a set of programs for harnessing the potential of older entrepreneurs. New York can look abroad for inspiration. An incubator in Israel, Dare to Dream, is providing a launching pad specifically for first-time entrepreneurs in their 50s, 60s, and beyond. New York could adapt that model for the five boroughs and launch the nation’s first public incubator focused on encore entrepreneurs. But that’s just one idea of many for boosting New York’s aspiring encore entrepreneurs. To help New York City realize this enormous potential, this report concludes with a dozen practical recommendations for the city, private industry, and nonprofit organizations. Taken together, these steps can enable more older entrepreneurs to start and grow businesses, add momentum and vitality to the city’s economy, and ensure their own financial well-being. 1. Center for an Urban Future analysis of self-employment data from the U.S. Census, American Community Survey, 2005 and 2016. Tabulated using IPUMS. 2. “2017 Kauffman Index of Startup Activity,” Ewing Marion Kauffman Foundation, May 2017, https://www.kauffman.org/kauffmanindex/reporting/startup-activity. 5. U.S. Census, American Community Survey, 2005 and 2016. 7. U.S. Census, Current Population Survey, March 2006 and March 2018. 8. “Summary of Vital Statistics 2015,” New York City Department of Health and Mental Hygiene, August 2017, https://www1.nyc.gov/ assets/doh/downloads/pdf/vs/2015sum.pdf. 9. “Breaking Through,” Center for an Urban Future, March 2016, https://nycfuture.org/research/breaking-through. 10. “AARP Member Opinion Survey 2016: New York Findings,” AARP, September 2016, https://states.aarp.org/wp-content/ uploads/2016/09/2016-MOS-External-Report-NY-Final-09-06-2016-Social-Security.pdf. This study was made possible by Capital One. Capital One’s Future Edge initiative is a $150 million, five-year effort to help more American workers and entrepreneurs succeed in the 21st century economy. Through Future Edge, Capital One works with hundreds of leading community and nonprofit organizations in NYC and beyond, including microfinance and micro-lending organizations empowering encore entrepreneurs such as Grameen America, Accion, and the Business Outreach Center Network. General operating support for the Center for an Urban Future has been provided by The Clark Foundation, the Bernard F. and Alva B. Gimbel Foundation, and the Altman Foundation. CUF is also grateful for support from Fisher Brothers for the Middle Class Jobs Project. STARTING LATER is a publication of the Center for an Urban Future. Researched and written by Judith Messina. Edited by Eli Dvorkin and Jonathan Bowles. Additional research by Gail Hankin, Julia Hotz, Nicholas Hoynes, Leah Jacobson, Elsa Van Latum, Stefan Manuel, Jennifer Meer, Alexa Schatzmann, Naomi Sharp, Neil Suri, Isabella Willeboordse, and Shiming Xiong. Designed by Rob Chabebe. Center for an Urban Future (CUF) is a leading New York City–based think tank that generates smart and sustainable public policies to reduce inequality, increase economic mobility, and grow the economy. Think you’re too old to become an entrepreneur? Not in Fairview Heights. Are 50-year-olds the new face of Staten Island’s entrepreneurs? This study was made possible through Capital One's Future Edge initiative, a $150 million, five-year effort to help more American workers and entrepreneurs succeed in the 21st century economy. Through Future Edge, Capital One works with hundreds of leading community and nonprofit organizations in NYC and beyond, including microfinance and micro-lending organizations empowering encore entrepreneurs such as Grameen America, Accion, and the Business Outreach Center Network. Learn more at capitaloneinvestingforgood.com or join the conversation on Twitter @YourFutureEdge.